Workshop this Sunday. Pre-order seedlings by March 6. Order online by March 6. Seedlings come in a pack of 4 as shown at right. Pick from 23 varieties of seedlings that grow best in our area, produce large harvests and resist pests. A 4-pack of seedlings is $4.00 ($1 per seedling). 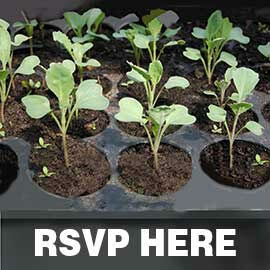 A full tray of 32 seedlings is $25 (78¢ per seedling). Different varieties of seedlings can fill the tray. Pick up seedlings between mid-April and early June from Good Earth Greenhouse in River Forest. The seedling pre-ordering project is part of our free Crop Planning workshop series. If you missed the first Crop Planning workshop, view the video on our YouTube channel. Don't miss our workshop about gardening in raised beds and containers on March 3. Links to all these web pages are on our website home page. Need help? Contact Estelle at 708-386-7197 estelle[at]deep-roots-project.org. Oak Park Main Library, (First Floor Community Room). Join us for an informative and exciting FREE workshop on growing your veggies in containers and raised beds! Get tips and tricks on soil, planting, fertilizers, watering, pests and more. Plus, Dan will give quick tips on growing his favorite 23 varieties of veggies. This workshop is co-sponsored by Deep Roots Project & The Sugar Beet Food Co-op. Get free seeds and a seed starting tray. Extend your growing season by sprouting your seeds indoors with grow lights in 2-3 weeks while it’s still too cold to germinate seeds outdoors. Following the workshop, will be a Seed Swap. Bring your extra seeds and your gardening stories. Deep Roots Project’s 2019 Kick-off Party! Please join us for a fun evening of community building, potluck dinner and learn about our many programs and volunteer opportunities. RSVP on EventBrite If you don’t RSVP come anyway. Bring food to share. Buy drinks at the Good Earth Café. We are actively seeking three experienced individuals to assist our core team with managing sales, coordinating volunteers, and reaching out to the community. Many more volunteer opportunities are also available. To learn more click the link at left and join us for the presentation and discussion on March 30th. Estelle is glad to meet by phone or in person to discuss all volunteering questions. Contact her at 708-386-7197 and estelle[at]deep-roots-project.org. We will continue monthly free workshops on organic edible gardening and related topics like growing a beautiful toxic-free lawn, food preservation and the best foods for good health. View a video of our Crop Planning Workshop from January on our YouTube channel with the button below. A big thank you to Kendall Dirks for recording and editing our workshops this year. Need an Edible Gardening Mentor? Contact David Murphy (dmurphy[at]deep-roots-project.org and (773) 502-5600) if you need a garden mentor.